HyperCam is powerful video capture software that records AVI movies (screencam) directly from your monitor, for software presentations, software training, demos, tutorials, and fun! HyperCam supports text annotations, sound, and screen notes (great for creating automated software demos). You can also select Frame rate and compression quality prior to video capture. This format can be played under Windows, as well as the Internet, unlike other programs that use proprietary formats that may need special viewers and be difficult, if not impossible, to edit. HyperCam lets you define the precise area of the screen you want to capture, unlike MS Camcorder and others that record the entire screen. These files can be useful as teaching tools, to demonstrate software, as a start for animation, and for many other uses. This easy to learn, flexible system will have you making your first screen movie in no time at all. 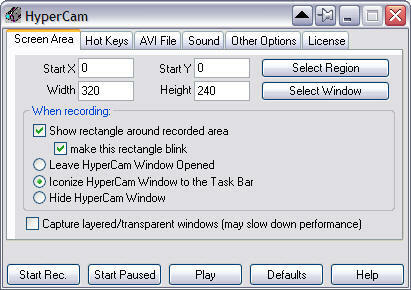 HyperCam captures the action from your Windows screen and saves it to AVI (Audio-Video Interleaved) movie file. Sound from your system microphone is also recorded. Please note that HyperCam is not intended for re-recording of other video clips from the screen (e.g. playing in Media Player, RealVideo, QuickTime etc. ), but rather for creating regular software presentations, tutorial, demos etc. HyperSnap is compatible with Windows XP, Vista, Windows 7, Windows 8 and 8.1 (32-bit, 64-bit).